For years I have thought of what I would like to create as a quartet of instruments. 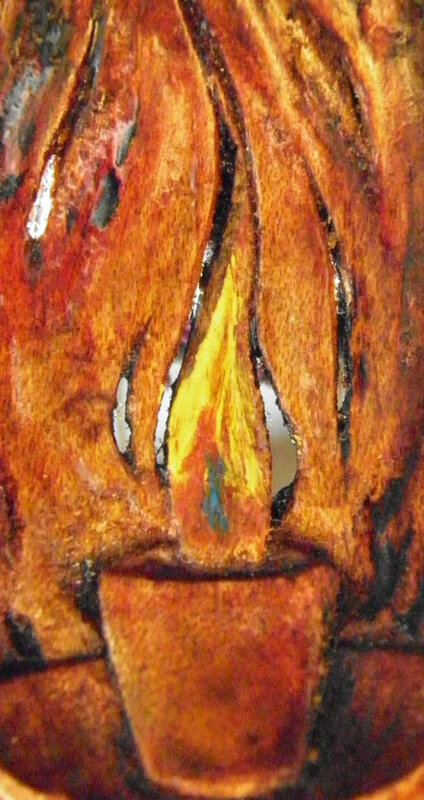 Finally, I settled on "The Four Elements" in honor of the ancient belief: all things in the universe consist of Earth, Fire, Wind or Water. Within those four elements lie all of creation. 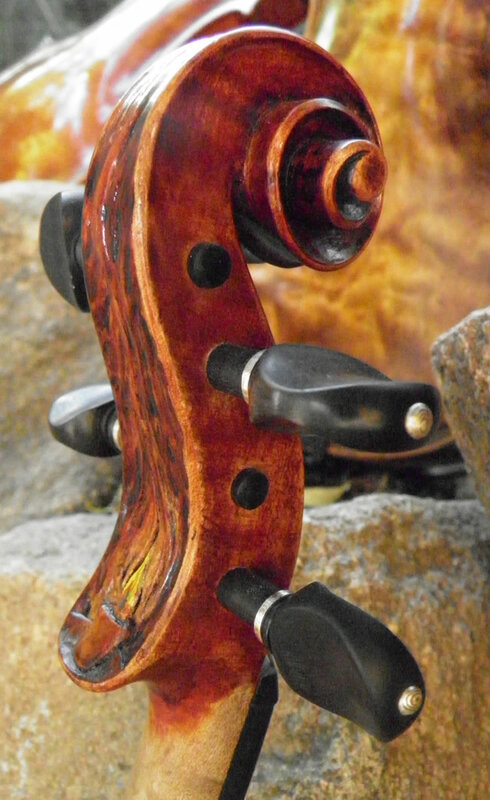 In my mind, the cello became Geo, the viola of course had to be Fiamma while the two violins would incarnate Vento and Acqua. 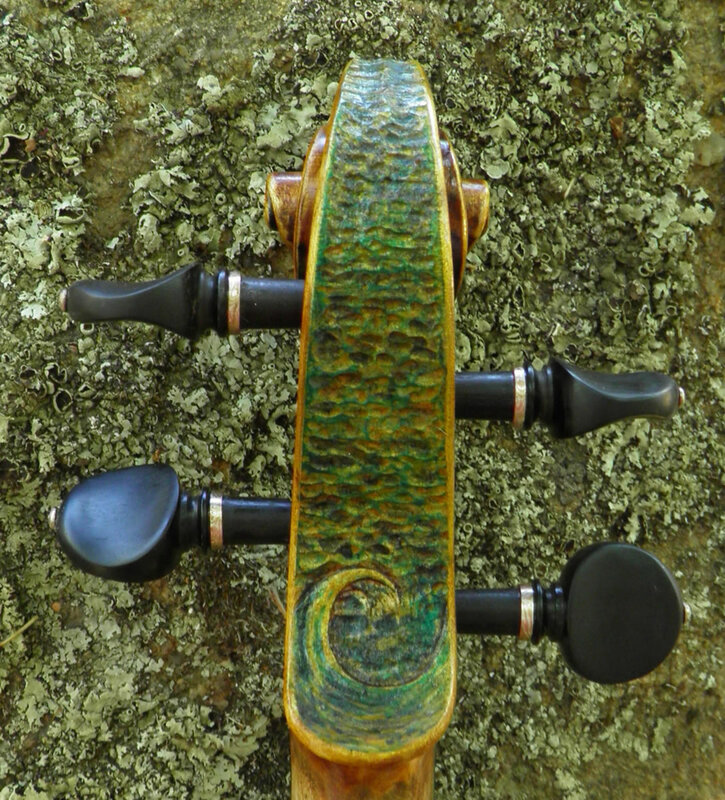 I have hand-carved each bridge for the instruments of the quartet, while jeweler, Chase Bramer, made the matching Mokume rings and peg end-studs to my specifications. 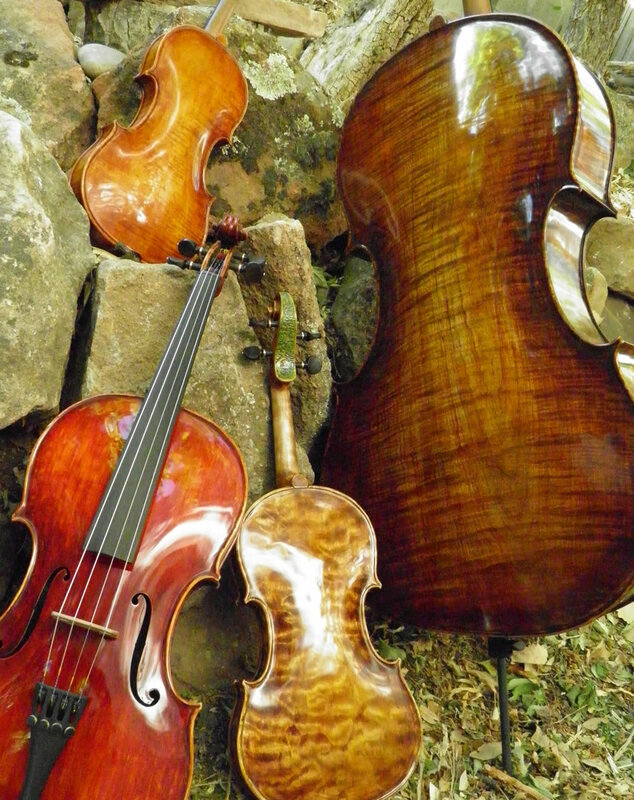 "Geo" is the bedrock and foundation of "The Four Elements." 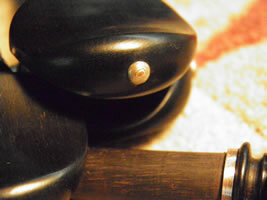 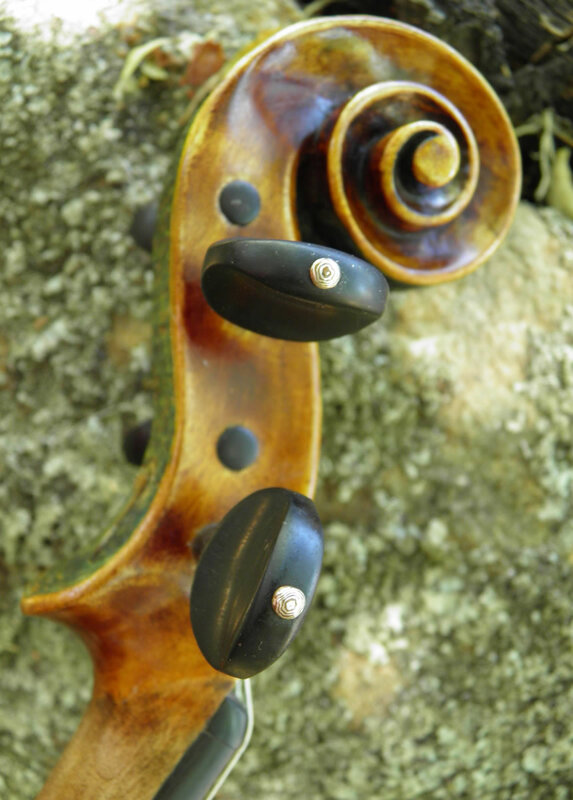 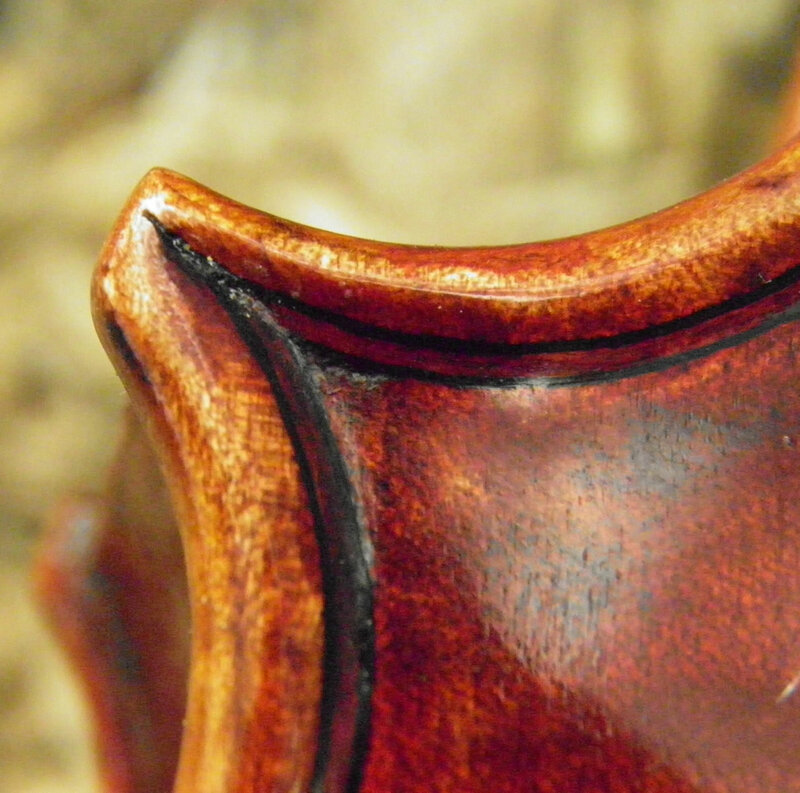 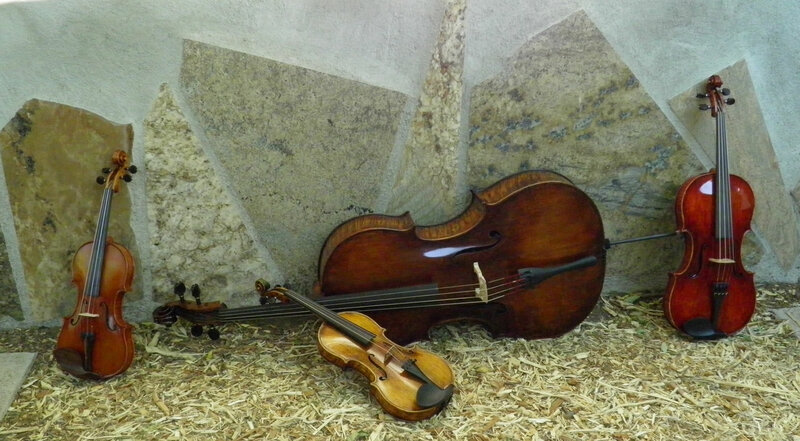 The cello is based on a large Stradivarius, the Servais. 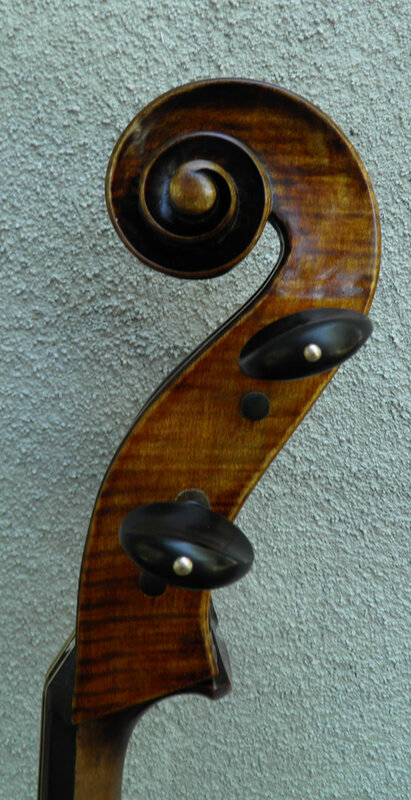 With a string length of 27 and 1/8th inches it is more suited to a large hand, but those cellists with an easy spread in the fingers will also find it comfortable to play. The tone is sweet and mellow with a "smell" of good garden soil. 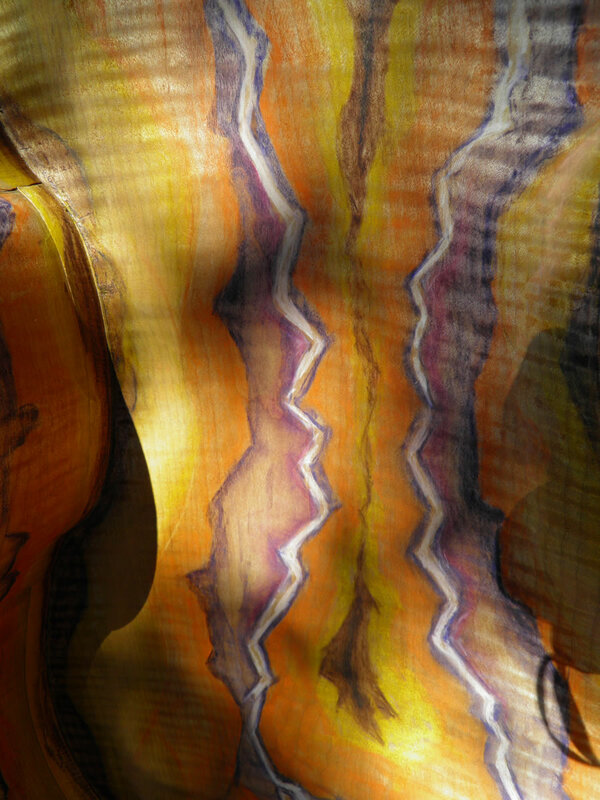 Inside is a painting which depicts the interior of a geode. 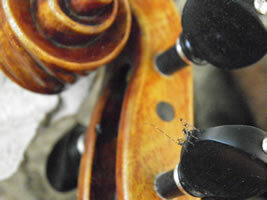 I began work on a string quartet as a gift to the future. 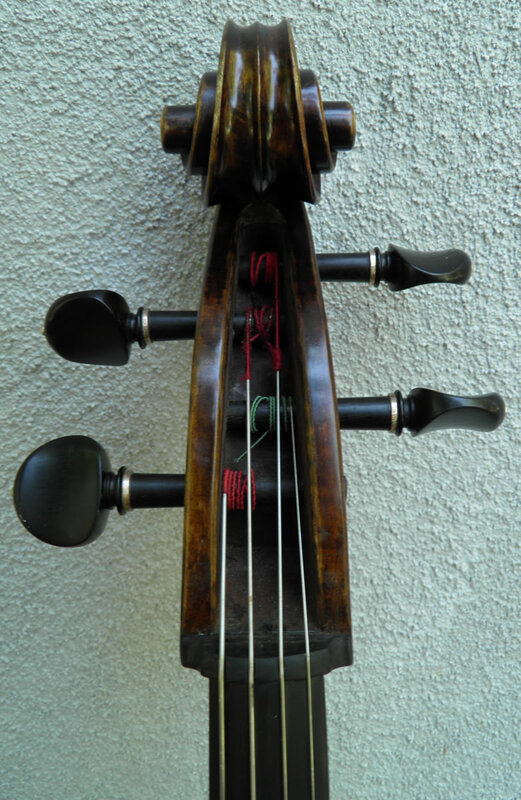 That said, "Fiamma," at a body length of 18 1/4", is a viola for the new string player, one who is at least 6'2" in stature and able to palm a basketball. 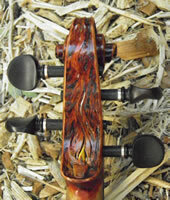 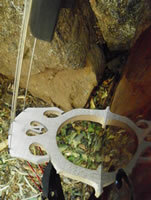 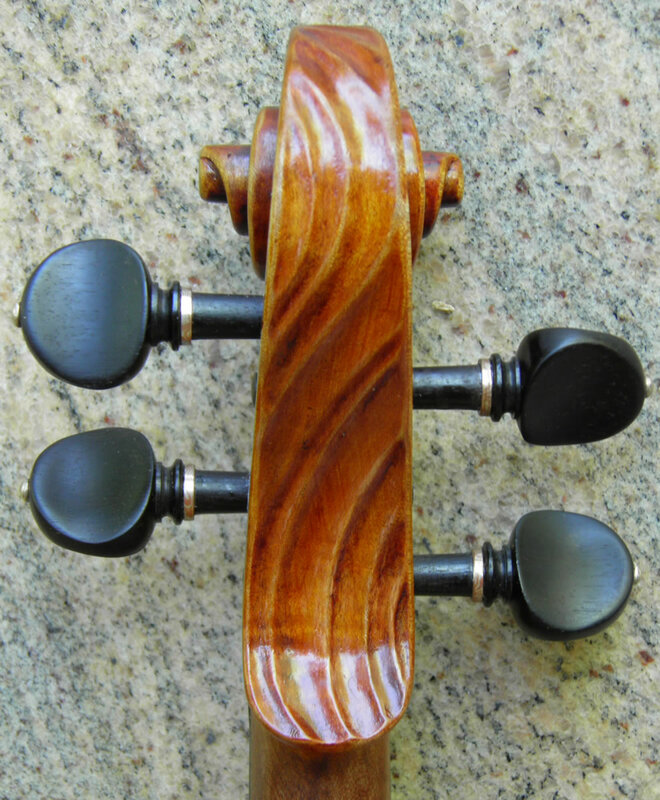 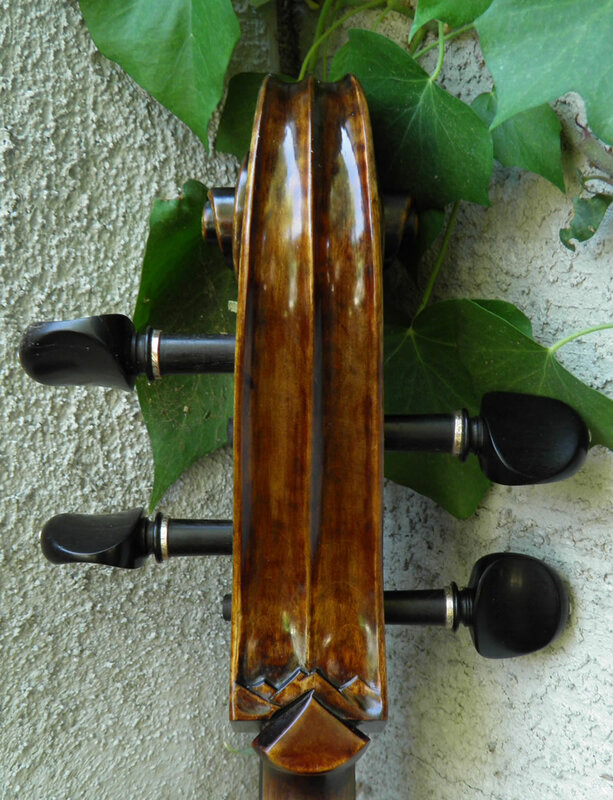 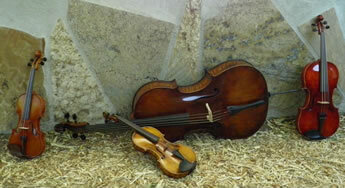 Strangely, the first fire-like viola was constructed in the 1600's by Steiner from whom I borrowed the design. 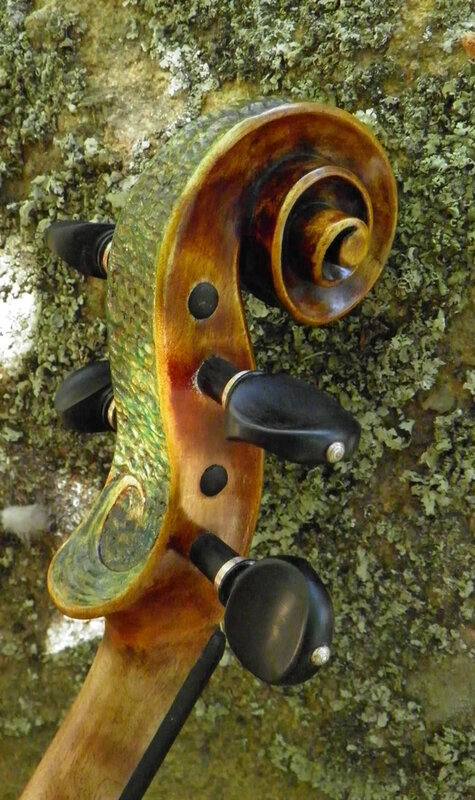 I took off from there with a Yellow Cedar top and a Big Leaf Maple back finishing with a flaming red varnish. 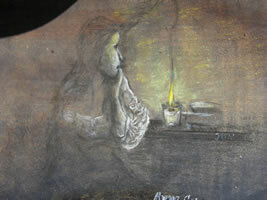 On the back of the scroll is a burning candle. Inside is a woman meditating by the light of a candle in the style of the painter, de la Tour, also at work in the 1600's. 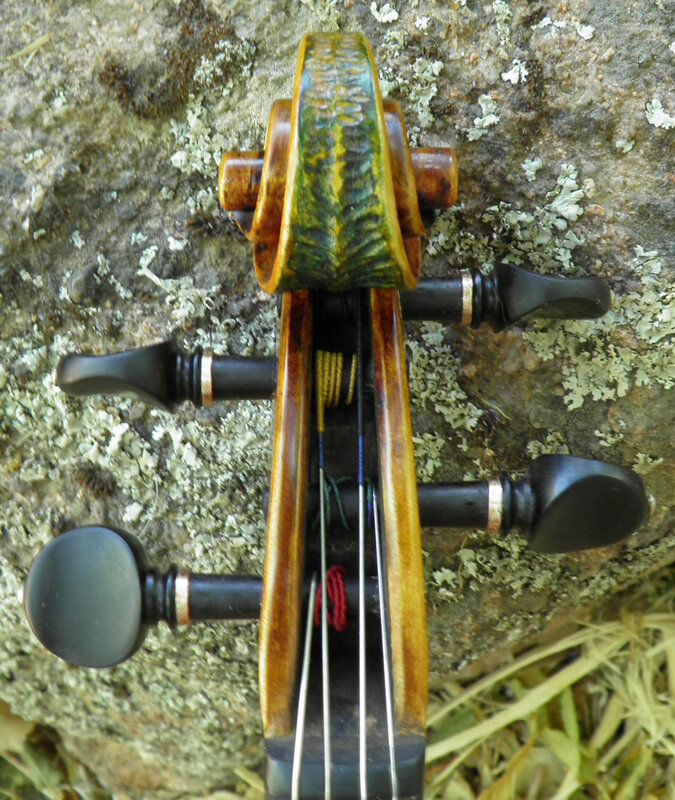 The tone has a slam-dunk sound. 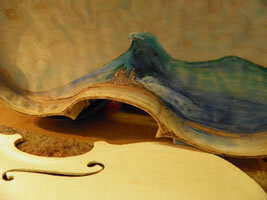 "Vento", a second violin with a voice as sweet as a Zephyr and can howl up a good dust devil when needed. 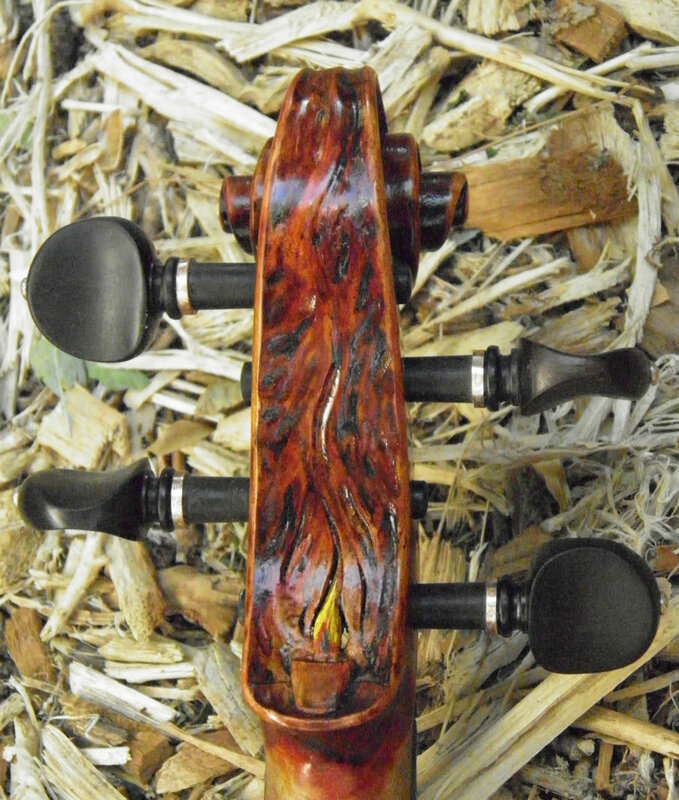 The model is mine, the top wood Western Red Cedar from an old dismanteled bridge, and the back is from a single piece of Big Leaf Maple. 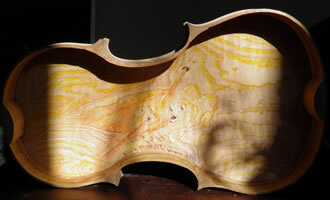 The color is Sahara Sand with dunes on the scroll and the wind always blowin' inside. 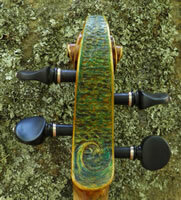 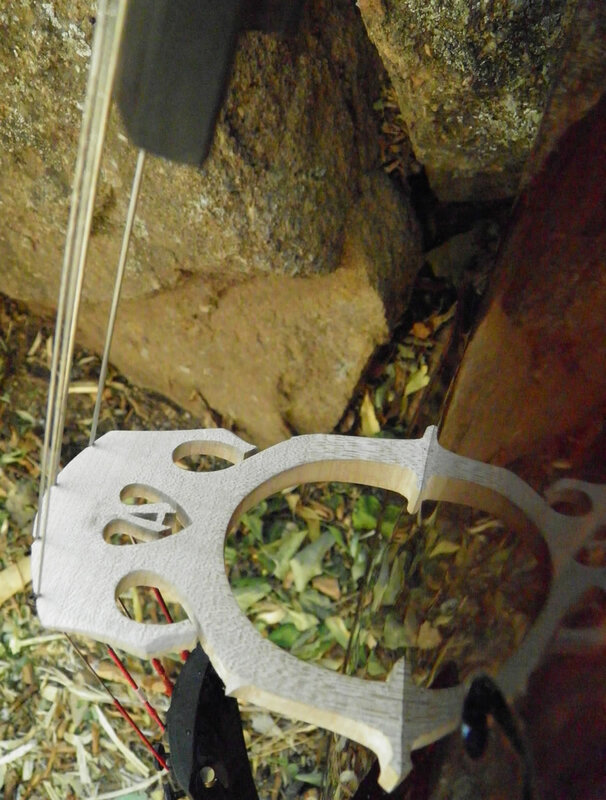 And the fourth element is, "Acqua," a violin of my design with a slightly larger body build. 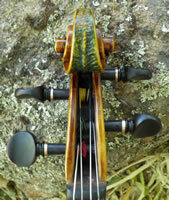 The tone of this instrument just came out with "I'm a leader" sounding from the moment I strung it up. 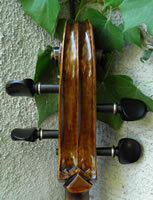 The body length is 14,1/4" or 36cm, the string length is 12,3/4" or 32.2cm. On the back of the scroll is a wave while inside a tsunami comes in with an awestruck crowd on the beach.